IFPMA member companies are working on increasing R&D for improved treatments and new vaccines for TB and MDR-TB, as well as partnering with others to expand access to treatment, diagnostics and care for patients. IFPMA endorses WHO’s End TB Strategy, envisioning a world free of TB with zero deaths, disease and suffering. Our industry is involved in a wide-ranging number of initiatives to support the global health community in achieving this vision. Tuberculosis (TB) is one of the world’s deadliest communicable diseases. In 2015, 10.4 million cases (estimated 1 million children) and 1.8 million deaths (estimated 170,000 children, not including those with HIV) occurred from the disease. TB is curable, but its long treatment regimen is demanding and unfortunately is difficult for patients to successfully complete. From 2000 to 2015, TB incidence has fallen by an average of 1.5% per year, with 49 million lives saved through effective diagnosis and treatment. 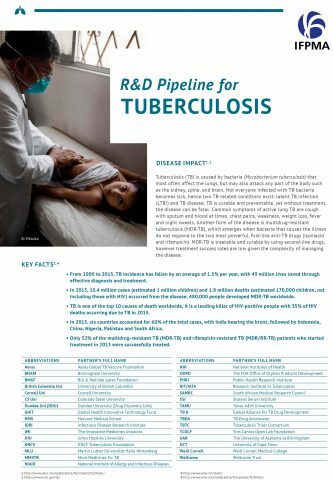 IFPMA member companies are working to develop improved treatments for TB and MDR-TB, as well as to develop new vaccines to stem the spread of this disease. Engagement unfolds around three main areas: research and development, access, capacity building, and advocacy. A key driver underpinning these areas is partnerships. Between 2012 and 2014, 3 new treatments were approved for MDR-TB and latent TB infection. There are currently over 60 R&D projects for TB medicines and vaccines in the pipeline, including 11 promising products in the late stages of development and 7 in phase III clinical trials. This means that these treatments or vaccines are reaching the final stages of the 10 to 15 year R&D process; a process where many other possible treatments or vaccines have fallen by the wayside. Companies are partnering with over 30 partners (research institutes, product development partnerships, NGO, etc.) to develop innovative medicines and vaccines. These include WIPO Re:Search a consortium providing access to intellectual property, pharmaceutical compounds, technologies, know-how and data for several diseases including TB; the Global Health Innovative Technology Fund (GHIT), as well as Aeras or the Gates TB Drug Accelerator (TBDA). Our companies are involved in over 30 partnerships to increase access to TB treatment, diagnosis and care. These programs include technology transfers with generics companies in countries with a high-burden of MDR-TB to increase local capacity in the manufacturing of MDR-TB medicines, reaching isolated groups with TB diagnostics through door-to-door screenings, training of health workers, preventing medicine stock-outs in rural health centres by working with mHealth providers. Many member companies are involved in projects to support the WHO and global advocacy groups to accelerate social and political action to stop the spread of TB. Our member companies are also very active in the global fight against fake medicines. It is estimated that 700’000 people die because of fake TB and malaria medicines every year. Fake TB medicines contribute to the spread of MDR TB and undermine efforts to reverse the global TB epidemic.